Whispers in the Loggia: On the Environment: A VP's "Inconvenient Truth" = The Vatican's "Inescapable Reality"
On the Environment: A VP's "Inconvenient Truth" = The Vatican's "Inescapable Reality"
Friday's announcement of the papal "yes" to a UN visit -- likely to take place in 2008, at the earliest -- adds another stop of spotlight on Rome's man at the organization's headquarters, Archbishop Celestino Migliore. The former Undersecretary for Relations with States (Vaticanese for "deputy foreign minister"), Migliore's meteoric rise through the diplomatic ranks landed him in the New York-based post not long after his 50th birthday. 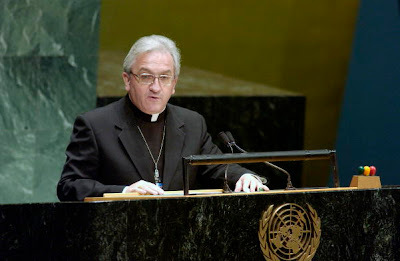 The fourth Permanent Observer of the Holy See to the United Nations, the 54 year-old prelate's two direct predecessors were brought back to Rome and given red hats at the end of their UN days; before Migliore's 2002 arrival, the post was held for 15 years by then-Archbishop Renato Martino, now on double duty as cardinal-president of the Pontifical Councils for Justice and Peace and Migrants and Itinerant Peoples. "There is no doubt that the latest assessment has established a strong connection between human activity and climate change," he said, referring to a February statement by the U.N. Intergovernmental Panel on Climate Change. Archbishop Migliore acknowledged that although not all scientists agree that climate change is occurring other environmental threats, such as indiscriminate deforestation, water pollution, the lack of potable water in many parts of the world and the depletion of fish stocks, demand action from the world community and individual Catholics alike. "We need to drink deep from this fascinating foundation of knowledge and wisdom, known as the aggressive and progressive degradation of the environment, that has become an inescapable reality," he said. Archbishop Migliore called God's placing of humans in the Garden of Eden with the instruction not only to tame nature, but to keep, or preserve, it as well. God's instruction was not so much a commandment but a blessing "to perfect, not destroy, the cosmos," he said. Any steps to protect the environment must depend on more than the use of technology and traditional economics; they must depend on "ethical, social and religious values as well," he said. Likewise, any corrective steps require turning to people in the developing world, especially those living in dire poverty, and making decisions with their advice and consent, the papal nuncio said. "With humans open to love, creation becomes the place for the mutual exchange of gifts among people," he said. Right in time for last Sunday's observance of Earth Day, the intervention was but the latest high-level Vatican plug for better care of the environment; Cardinal Martino hosted a rather "heated" top-level international conference on climate change earlier this week, and Pope Benedict's recent Post-Synodal Apostolic Exhortation Sacramentum Caritatis reiterated at its close the pontiff's numerable interventions to date on the importance of being good stewards of the earth. "The world is not something indifferent, raw material to be utilized simply as we see fit," Benedict said. "Rather, it is part of God's good plan, in which all of us are called to be sons and daughters in the one Son of God, Jesus Christ. "The justified concern about threats to the environment present in so many parts of the world is reinforced by Christian hope, which commits us to working responsibly for the protection of creation." And Benedict's not just talking the talk, either: zipping around behind the Vatican walls, his ride of choice is an electric golf cart.